In Soviet Russia, a car wouldn't download you! Note: Completing the quests line rewards the ilvl 710 ring. You don't actually have to defeat the Iron Maidens in order to loot the quest item, the clickable box is always available. Hotfixed on 6.1, box is now found outside the arena on the right side, after the boss is defeated. Might have been nice of the tooltip would have said the box can be found after the Iron Maidens fight! How can you get ! Reverse Piracy ? After beating Kromog in The Black Forge raid, I can see Dead Grotto and the quest item on the map, but I can't get there. If you're trying this in LFR, you want the Iron Assembly queue. The quest item was moved from within the boss area and is now next to the boss area with the huge boxes. Wasn't able to loot this today in a normal run, assuming it was because I had done LFR earlier in the week and forgot to loot it, but it didn't show up in the normal run. Will try again next week and see if that was the case. At the time of this posting, the item you want is not at the location currently shown on the map for the quest; here's a screenshot showing where I was on the map when I stood near the item (86.7, 38.4); you'll notice the number "2" is where the map currently shows the item supposedly is, which is wrong. 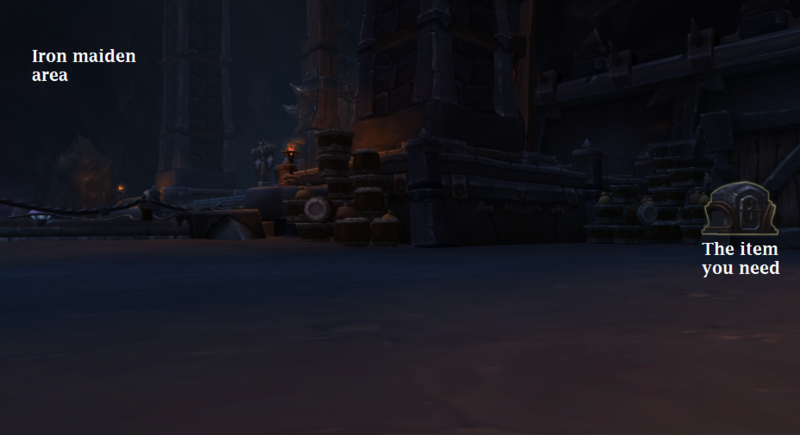 To clarify, it is located near (but not exactly IN) the area where you fight the Iron Maidens, in the Iron Assembly portion of Blackrock Foundry. It can be done on LFR. Here's another screenshot, showing what the item and the area around it look like. Hope this helps. Edit: I read on here that supposedly the box does not show up until after you have fought the Iron Maidens; this may be true, I don't know because I only looked for it after the fight was over. Assuming you have TomTom, /way 87.4 38.9 once you're on the right floor. Or just look at this map. ...I don't know what I expected. You NEED to kill the last boss first, then you will be able to see the box. If you have the quest tracked, do not get mislead while being in other queues - there is no way to get there in the three other LFR wings. Only Iron Assembly is viable. I am showing an exclamation mark on my map in Tanan for this quest at 18, 78. I see no way to get to this. I have tried both from the north, through Tanan, and from the south by swimming around. Neither route allows me to get to this marker. Got to run Iron Assembly. The quest item is just near the last boss, Iron Maidens. Our raid had killed all the bosses but the gate was closed to the area where the quest item was located. I am surprised no one else has mentioned this in comments. Two others were stuck with me unable to get in. Anyone know a reason for this or a workaround? Beschafft die thaumaturgische Kugel der Draenei aus der Entsetzlichen Grotte in der Schwarzfelsgießerei. <Name>, während des Angriffs auf Karabor haben die Schlachtschiffe der Eisernen Horde die meisten Schiffe der östlichen Draeneiflotte geplündert oder versenkt. Dabei haben sie auch ein unersetzliches Artefakt erbeutet: Eine echte thaumaturgische Kugel der Draenei. Ich brauche diese Kugel! Diese Orcs haben ja keine Ahnung, was sie da an sich genommen haben! Meine Quellen besagen, dass sich die Kugel an Bord eines Schiffes befand, das zurzeit in der Entsetzlichen Grotte unterhalb der Schwarzfelsgießerei umgebaut wird. Durchsucht das Schiff und seine Umgebung nach der Lade der Sha'tar, in der die Kugel aufbewahrt wurde. Wir müssen sie zurückbekommen! Die Kugel! Habt Ihr wirklich die Kugel gefunden...? Ich weiß nicht, was ich erwartet habe.